Rossmoor Village is an award-winning active adult community in Monroe set in Middlesex County, New Jersey. It was built to look like an old New England village, complete with old-fashioned street lamps. While this 55+ community is full of Old World charm, it has all the modern amenities and conveniences active retirees could ever need and want. This gated community features a 30,000 square-foot clubhouse with 18 holes of golf, a full-time entertainment and recreation department, a health center, an amazing array of different home styles set on 418 acres of land, and a large variety of interest groups, making Rossmoor Village a popular active adult community in Middlesex County. The beautiful clubhouse features a ballroom, a fully-equipped kitchen, library, computers, billiard rooms, and a large variety of hobby areas. Those include an art studio, woodworking shop, sewing room, ceramics studio, a dark room for photography, as well as card and reading rooms. The health center is a separate building and has a nurse on site. The fitness studio has plenty of exercise machines and weights suitable for full-body workouts. 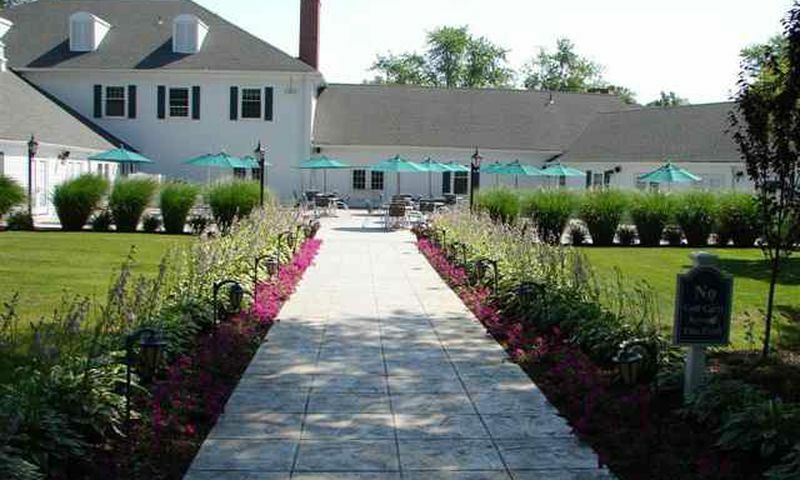 Outside, there are six wicket professional croquet courts, three bocce ball courts, three full-size tennis courts, and eight shuffleboard courts. A 72-par, 18-hole championship golf course set on 104 acres takes center stage. After all these activities, residents can relax in the heated Olympic swimming pool, complete with a hot tub, or mingle on the sundeck. The homes here were built between 1965 and 1991 and range in size from around 590 to over 2,259 square feet. There are condominium, and ranch-style homes for a total of 2,303 residences. There are several different floor plans among the condominiums including some that are second-floor models. The ranch-style homes have two bedrooms and two or two-and-a-half bathrooms with year-round Florida rooms or patios. Some have attached garages, while others have carports. All homes, regardless of model, have plenty of closet space. Association dues vary by style and model. The monthly fee for all home styles includes maintenance of all common areas, exterior maintenance, lawn care, snow removal, water, sewer, garbage, and basic cable among other things. Residents enjoy a worry-free lifestyle with many activities that support their active, social, and cultural interests. A full-time entertainment and recreation department with several employees handles an ever-changing program of concerts, movies, lectures, organized day trips, and overnight trips. In addition to the plentiful amenities and scheduled activities, this active adult community offers many classes, social groups and organizations. Classes include fitness and dance activities such as line dancing, Zumba, water aerobics, yoga, meditation, and more. Clubs cover a wide spectrum of interests including arts, cards, games, sports, culture, and education. Residents can also participate in a large variety of religious organizations. This 55+ community is less than a half mile from the New Jersey Turnpike at exit 8A, making it easy to explore the surrounding area or take day trips. For medical needs, residents can choose from four hospitals in the area. Grocery stores, restaurants, drug stores, home improvement stores, a movie theater, as well as a parlor and beauty shop are all within minutes. The Concordia Shopping Center is only two miles away. In less than 15 minutes, residents can drive to the Freehold Raceway Mall. Active adults can also visit the Senior Center in Monroe and participate in the center's activities. Outdoor lovers will enjoy Thompson Park which offers 675 acres of walking and hiking trails, picnic areas with grills, fishing, ball fields, ice skating, and a mini zoo. The nearby Jersey Shore beaches are a great destination for hot summer days, while anglers will find plenty of fishing spots to pursue their interest. New York City, Philadelphia, and Atlantic City are all within 90 minutes away. Newark International Airport can be reached within 45 minutes for convenient long-distance travel. Rossmoor Village has the incredible location in Monroe, NJ to make it a desirable active adult community. There are plenty of activities available in Rossmoor Village. Here is a sample of some of the clubs, activities and classes offered here. There a wide variety of condos within Rossmoor Village. These low-maintenance homes feature one to two bedrooms, one to two bathrooms, and carport parking. There are a handful of single-family floor plans offered within this gated community. These beautiful homes feature two bedroom and two or two-and-a-half bathrooms. Some homes offer a garage or carport parking. We have lived in the Rossmoor Community for three years and love the beautiful landscapes and views of the award winning golf course. We updated our New York I model which has 1484 square feet of living space and is one of the larger models in this beautiful community. I would highly recommend making this community your next place to live!!! We bought our home in Rossmoor in the summer of 2017 after thoroughly investigating three other adult communities in Monroe with homes for sale in our price range. When we saw this one, it rose to the top of the list. We are New Englanders, and this community felt like Hometown USA. The mature landscaping and tree-lined streets, the diversity of home styles, many of which reflected early New England architecture, and a Mr. Roger's Neighborhood atmosphere, all had us saying, "You had me at the curb." But inside our upgraded Penn II manor we found even more to be excited about. Special features for us were The Man's Den, the south-facing sunroom which feels like Florida, and more storage space than we have ever experienced in any home. Everything on one floor, and a garage too, plus a well-groomed golf course as our back yard. Privacy, security, and serenity! We have lived here in Rossmoor for almost two years and could not be happier with our home. We have looked at other 55+ homes near by and the community I feel is a more homey place to live. The neighbors I have met here are all friendly and I feel the amenities here are exactly what I was looking for. We've lived here for nearly 5 years now and really like it. The community is a little older but the people here are very friendly and make you feel like family. We found a beautifully updated home here when we bought and it was worth every penny. I'm glad we were able to find a place that didn't need a lot of extra work. Some of the amenities could use a little updating but overall it's a really great neighborhood. 55places.com is not affiliated with the developer(s) or homeowners association of Rossmoor Village. The information you submit is distributed to a 55places.com Partner Agent, who is a licensed real estate agent. The information regarding Rossmoor Village has not been verified or approved by the developer or homeowners association. Please verify all information prior to purchasing. 55places.com is not responsible for any errors regarding the information displayed on this website.